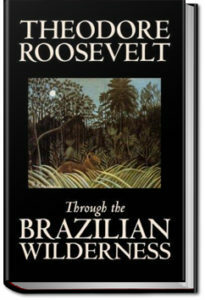 Roosevelt’s popular book Through the Brazilian Wilderness describes his expedition into the Brazilian jungle in 1913 as a member of the Roosevelt-Rondon Scientific Expedition co-named after its leader, Brazilian explorer Cândido Rondon. The book describes all of the scientific discovery, scenic tropical vistas and exotic flora, fauna and wild life experienced on the expedition. One goal of the expedition was to find the headwaters of the Rio da Duvida, the River of Doubt, and trace it north to the Madeira and thence to the Amazon River. It was later renamed Rio Roosevel. Roosevelt’s crew consisted of his 24-year-old son Kermit, Colonel Cândido Rondon, a naturalist sent by the American Museum of Natural History named George K. Cherrie, Brazilian Lieutenant Joao Lyra, team physician Dr. José Antonio Cajazeira, and sixteen highly skilled paddlers (called camaradas in Portuguese). The initial expedition started on December 9, 1913, at the height of the rainy season. The trip down the River of Doubt started on February 27, 1914.